Some worry that inaction — or regression — will push the planet past a point of no return. “How the Trump Administration Could Gut NASA’s Climate Change Research,” read one Newsweek headline. “What Does Trump Think About Climate Change? He Doesn’t Know Either,” announced The Atlantic. And “Without action on climate change, say goodbye to polar bears” — a Washington Post heartbreaker. According to reports such as these, Trump is preparing for everything from a witch hunt against our government’s foremost climate scientists to de-funding the Environmental Protection Agency. His own words make these sky-is-falling headlines seem less like reading tea leaves and more a hard-and-fast road map. But in the world of academia, where facts don’t bow to the short attention spans that dominate in the media, do the Bay Area’s most level-headed researchers and earth-science experts respond to Trump’s ascension with similarly grabby quips? Are they as terrified by the nominations of former Texas Gov. Rick Perry (for Department of Energy) and Scott Pruitt (for EPA head, even though the former Oklahoma attorney general is suing the agency)? The Express asked David M. Romps, an associate professor of earth and planetary sciences at UC Berkeley and the director of the school’s Atmospheric Sciences Center, whether he thought there was grounds for this bevy of doomsday news flashes. The reason? “There’s just not that much time to bend down that curve of emissions,” he explained, referring to the level of carbon dioxide humans are spewing into the atmosphere. Trump of course hasn’t implemented a lick of policy yet. And every expert interviewed for this story reiterated that they don’t want to guess how his administration will approach climate change. In the words of Bay Area environmental and energy policy expert Hal Harvey, the CEO of Energy Innovation, an environmental policy firm, “one shouldn’t either be sanguine or suicidal” just yet. That said, the cast of anti-climate change actors on the Trump transition team doesn’t inspire much confidence. For example, there’s Myron Ebell, tapped to lead Trump’s EPA changeover. Ebell runs an Astroturf outfit called the Center for Energy and Environment, and he masquerades as a sort of science-friendly, social-justice warrior, writing things like “abundant energy makes the world safer and the environment more livable,” and “affordable energy should be accessible to those who need it most, particularly the most vulnerable among us” on his group’s website. But his organization is mostly underwritten by the oil industry, and his modus operandi has always been to countervail legitimate climate research with smarmy deception. 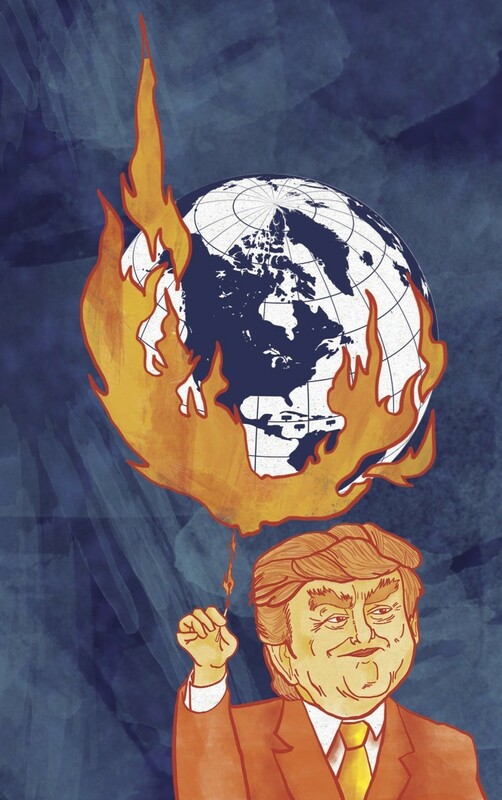 Other Trump advisers hail from various outposts of the fossil-fuel industry and its policy shops, including Thomas Pyle, a former Koch Industries lobbyist and policy analyst for erstwhile majority whip Tom DeLay; Doug Domenech, a once George W. Bush administration staffer turned pro-fossil fuel advocate; and Bob Walker, who has gone on the record as wanting to eliminate all climate-science research at NASA. This is of course not to mention the more patent anti-climate-science cronies, such as proposed Trump secretary of state and former Exxon Mobil COE Rex Tillerson, or Perry (who memorably said he wanted to disband the department he’s now poised to lead), and Pruitt (one of the foremost players in the resistance against the Obama administration’s energy policy). “All of these people share a common thread” explained Romps. Namely, they are employed by, work for, or operate a front organization at the behest of major oil and energy corporations. “And of course the fossil-fuel industry has a strong agenda, that’s no longer a secret,” he added. Read: They’re about profits, not mitigation. Their game plan is to demolish Obama’s climate-change legacy and profit off what remaining dead dinosaurs lay beneath the Earth’s surface. So goes the collision course: Two opposing forces — one for saving the planet, the other for digging up and burning every last drop of oil and coal — with a scheduled face-off in less than two weeks at the White House. And the clock is, as they say, very much ticking. “Time is of the essence,” emphasized Harvey, who is not one for fear-mongering, but didn’t want to underestimate how costly it would be to stall out, or go in reverse, when it comes to climate and energy policy, during the next four years. The positive news for environmentalists is that this policy is complicated, often dictated by market forces beyond the Trump administration’s influence, and in many ways insulated by state’s rights and world movements. On the flip side, there are climate-action strategies and pacts scarily within the realm of Trump’s authority, such as the Paris Agreement, which was settled upon by nearly 200 nations and went into effect just days before Trump’s election last November. The goals of the accord include limiting the rise of the average global temperature to less than 2 degrees Celsius above pre-industrial levels (right now, the world is nearing 1 degree), and focusing development on green industries and practices. The Paris Agreement isn’t binding — it’s a name-and-shame type deal, experts explained — and Trump has hinted at abandoning the pact. This would mean that, while the rest of the world is adopting smarter climate policies, we’ll be discredited as an outlier nation. Trump also carries influence over the EPA’s Clean Power Initiative, which is stalled in the courts, and fuel-efficiency efforts, an area where the nation has seen significant progress. And he can revive and approve contentious pipeline infrastructure, such as the Keystone XL project, and de-regulate oil drilling and transport industries, as well. All of this will invariably grow C02 concentrations in the atmosphere, even while the rest of the world implements policy to keep levels at below 400-parts-per-million. “We spend more on potato chips in America than we do on energy R&D,” Harvey explained of science’s currently limited coffers. He said he hopes to have “very productive discussions” with the new leadership in Washington, and he pointed out that this is a unique moment in time when “the science community is generating dramatic advances that do have an advantage of benefitting society at large,” such as electric cars, energy storage, and affordable solar cells. Romps agreed. “California potentially could step up to a new role here, and now it could really be the bastion of hope,” he said. California also has a lot at stake. Both Assembly Bill 32, the Global Warming Solutions Act passed under Gov. Arnold Schwarzenegger in 2006, and Senate Bill 32, which Brown inked last year, mandate greenhouse-gas-emissions reductions unequaled in the rest of the country (specifically, 40 percent below 1990 levels by 2030). Trump could, in theory, run interference against these ambitions. But his plate in D.C. will surely be brimming with controversy. He may not have time to throw a wrench into California’s climate innovation gears. All the Bay Area experts agreed, however, that an uphill battle is education — something Trump can very easily stump, often with just 140 characters. Romps, who will teach the first-ever undergraduate introductory course on climate change at UC Berkeley next fall, said that he’s “fascinated” by the question as to why so few Americans relate to and comprehend the threat of climate change.